A continuation of the monologues our congregation has been hearing through the season of Lent. 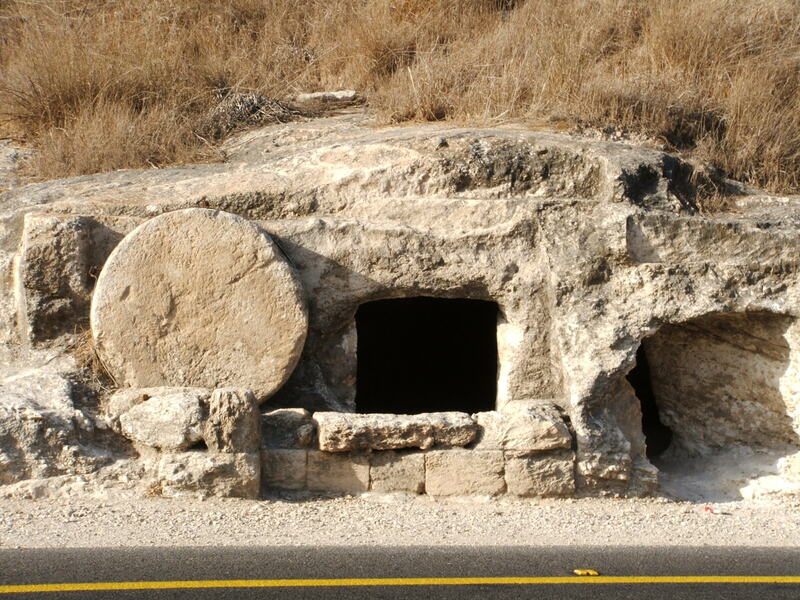 First century tomb in Israel. I’m the type of person who likes to have everything in order. I enjoy keeping up with household chores; the cooking, the cleaning. Some may call me overly particular but, I like everything to be perfect. I recall,once, when you visited, you gently reprimanded me for worrying and fretting too much. You smiled and reminded me that sitting down, relaxing, and listening to you was acceptable. But after you’d left, Lazarus fell ill. I was afraid. There was nothing we could do. It happened so suddenly and his condition worsened within a short period of time. We felt helpless. We sent for you because we knew you had healed people before. Our hearts told us that you could do the same for Lazarus. But, you didn’t come, and our brother died. I was upset. I couldn’t understand. Why had you not come sooner? Why had you let Lazarus get sick? Why did you allow him to die? It didn’t make sense. Mary and I sat on the floor of our house in absolute grief. We couldn’t go about our normal tasks. We didn’t go to synagogue. Our grief seemed inconsolable. Many friends and neighbors tried to comfort us, to sit with us, to pray with us. Then I overheard someone say you were back. I bolted up, abandoning custom, and ran as quickly as my bare feet would allow until I found you. I didn’t dare hope you would bring him back now. I knew he would rise again on the last day, but right now seemed too good to be true. Lazarus had been dead four days — It was hopeless — or so it seemed. You came with us to the tomb and wept alongside us. Your tears stirred my soul. I knew you had loved my brother as much as I had. Then you did something that we will never forget. After telling some men to roll away the stone, you called out in a loud voice, “Lazarus, come out!” Lazarus emerged from the dark tomb — oh, he did. The brother I never thought I would see again in this world walked out of that tomb, still bound in burial cloths. I know that you are the Messiah. I now know that you are more powerful than death itself. All who believe in you will live even though they die. You are the Resurrection. You are the Life. A special thanks to Glynis Belec for her help in the editing process.